WF123ASWGYLNG0 is an IPS 12.3 inch TFT-LCD module with Projected Capacitive Touch Screen (PCAP). This TFT-LCD is featured with IPS panel which is having the advantages of wider viewing angle of Left:85 / Right:85 / Up:85 / Down:85 degree (typical) and having HD resolution (1920×720). WF123ASWGYLNG0 is a Bar Type TFT module which is having aspect ratio of 24:9 and its brightness is 800cd/m2. This 12.3” IPS TFT-LCD module is having 2-channel LVDS (2 port LVDS) interface with HD resolution of 1920 x 720 pixels. It is featured with super wide temperature of operating temperatures from 30℃ to +85℃; storage temperatures range from -40℃ to +95℃. 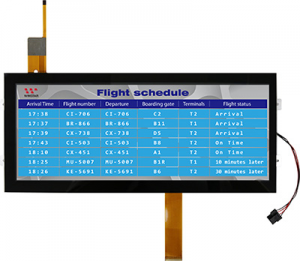 WF123ASWGYLNG0 is an IPS industrial grade Bar Type with high brightness TFT display modules. It is very suitable for industrial equipment & automotive applications, POS system and advertising display, etc.